The Holy Qur'an: Surah 75.31 (Al-Qiyamah): "So he gave nothing in charity, nor did he pray! 36. Does Man think that he will be left uncontrolled,(without purpose)? Woe to thee, (O man! ), yea, woe! Again, woe to thee, (O man! ), yea, woe! "5825. His indictment in this and the succeeding verse consists of four counts: (1) he neglected prayer; (2) he neglected charity; (3) he rejected Truth; and (4) he turned away. In 74:43-46, the four counts are: (1) neglecting prayer; (2) neglecting charity; (3) talking vanities; (4) denying the Day of Judgement; see n. 5803. Nos. (1) and (2) are identical in both places, and Nos. (3) and (4) are analogous. Rejecting the Truth is equivalent to talking vanities and making an alliance with falsehoods. Denying the Day of Judgement means behaving as if no account was to be given of our actions. i.e., turning away from right conduct." They have made it appear as if the Almighty Creator is making general statements of actions leading to sin. Such a casual attitude to a future prophecy of paramount importance is due to centuries-old deep-seated disbelieve and denial that Allah will reveal, promulgate, recite and explain Qiyamah. Verses 75:31-35 narrates what will happen following the announcement of Qiyamah. The entire chapter 75 is exclusively devoted to Qiyamah and any line of interpretation that does not make this a cardinal rule will only mislead. Every single alphabet, word, sentence and verse of chapter 75 talks about the Resurrection, and nothing else. We repeat - NOTHING ELSE! The ulema cannot explain why humans are still going about rejecting the Truth on this terrible Judgment Day, while the Earth is being rent asunder, eyes dazed, moon darkened and crashing into sun, trumpets being blown, skeletons emerging from graves, and terror all around. It is completely illogical that the vast majority of human beings are still going about their ignorant ways, oblivious to the catastrophic chaos and natural disasters of Judgment Day all around them! The Islamic scholars have to disfigure this verse because they cannot figure out why humans will be going about their normal business on Qiyamah, absolutely unconcerned about their trumpeted Day of Terror and Mayhem! Why has Abdullah Yusuf Ali and his forty Thieves of Truth lead hundreds of millions into the dungeons of their own delusion? Will they now please read Chapter 75 of Al Qiyamah in the Qur'an a few times, and then answer all the questions listed below that completely contradicts their Doomsday scenario. Before answering please point to a single sentence, even a word in the entire chapter 75 of Al Qiyamah that strikes terror! 1) Why are humans still, on the contrary, not giving in to charity if it is the Day of Judgment? 2) Why are humans still, on the contrary, not praying if it is the Day of Doom? 3) Why are humans still, on the contrary, rejecting the Truth if it is the Day of Dues? How can disbelievers shrug off the death and destruction of Al-Qiyamah so easily, or does reading these lines while there is peace and quiet outside allow such a likelihood? 4) Why are humans still, on the contrary, stalking to their families in rejection if it is the Day of Dread? How is it possible for humans to deny such a terrible earth-shaking devastation and still return to their families in rejection, or does the present peaceful commencement of the Night of Power lull them into disbelieve? 5) Why are humans still, on the contrary, talking in conceit if it is the Day of Apocalypse? How is it possible for humans to return to their families and defy proudly without any fear about this Calamitous Day, or does this present Peace till Dawn not disturb anyone? 6) Why are humans still, on the contrary, rejecting it with impunity if it is the Day of Death? How is it possible for such a Great Event to be brushed aside without care or concern, or is it because the Day of Noise and Clamor is still far off? 7) Why are humans still, on the contrary, defying with arrogance if it is the Day of Destruction? How are Muslims still able to so arrogantly defy their revered Qur'an and the much-feared Doomsday, or does the present Night of Power allow them this delusion? 8) Why are humans still not afraid though the full glory and light of the Lord is Shining? Or does the present Night of Power (Al Qadr) precede the future Day of Noise and Clamor (Al Qariah)? 9) Why are humans still not aghast though the trumpets have been blown? Or does the present Night of Power (Al Qadr) commence before the future Day of Noise and Clamor (Al Qariah)? 10) Why are humans still not petrified though rejecters have been raised up blind? Or does the merciful Night of Power (Al Qadr) go before the wrathful Day of Noise and Clamor (Al Qariah)? 11) Why are humans still not fearful though the heavens have been rent asunder? Or does the peaceful Night of Power (Al Qadr) herald the devastating Day of Noise and Clamor (Al Qariah)? 12) Why are humans still not screaming in terror though the Judgment Hour has descended suddenly? Or does the warning of the present Night of Power (Al Qadr) pave the way for the future Day of Noise and Clamor (Al Qariah)? 13) Why are humans still not in terror though the sky is like molten brass? Or does the cleansing Night of Power (Al Qadr) preceed the regretful Day of Noise and Clamor (Al Qariah)? 14) Why are humans still fearless though the mountain are tossed around like wool? Or does the present preordained Night of Power (Al Qadr) lead the future Day of Noise and Clamor (Al Qariah)? 15) Why are humans still not apprehensive though the stars have been dimmed? Or does the present compassionate Night of Power (Al Qadr) come prior to the merciless Day of Noise and Clamor (Al Qariah)? 16) Why are humans still not frightened though the heavens are cleft asunder? Or does the present Night of Power (Al Qadr) for Believers lead to the future Day of Noise and Clamor (Al Qariah) for transgressors? 17) Why are humans still calmly disputing Qiyamah even though the mountains are ripped and strewn like dust? 18) Why are humans still not groveling for mercy though the Spirit and Angels stand forth? The Day that the Spirit and the angels will stand forth in ranks, none shall speak except any who is permitted by the Most Gracious, and he will say what is right. 19) Why are humans still not praying though the sky is being ripped open? 20) Why are humans still not cringing though the stars are strewn around? 21) Why are humans still not cowering though the oceans are swelling with death and destruction? 22) Why are humans still not recoiling though graves are turning over and zombies coming to life? 23) Why are humans still not shrieking though the Earth is being pounded to powder? 24) Why are humans still not fleeing though there is noise and clamor everywhere? There is absolute no relation between the present Resurrection or Night of Power (Al Qadr) and Judgment Day or Noise and Clamor (Al Qariah). They are two different and distinct times. The Islamic interpreters have brought in the analogue of Judgment Day to the Day of Qiyamah - already defective by severe misconceptions - and this leads True Believers (Al-Mu'minun) astray. An analogue is not a fact as it depends entirely on the line of interpretation. Interpretation is not an exact science as it depends entirely on the knowledge of the scholar. Knowledge is not an exact science as it depends entirely on the depth of Truth. Truth is an exact science as it is not flawed by ambiguities, contradictions, analogues, misconceptions, misinterpretations, conjectures, speculations, half-truths, theories, guesses, mysteries, enigmas, fanaticism, personal convictions or any other human deficiencies. For the human race the difference now, as these lines are read, between analogue and Truth is that between Heaven and Eternal Fire, Al Qadr (Night of Power) and Al Qariah (Day of Noise and Clamor). 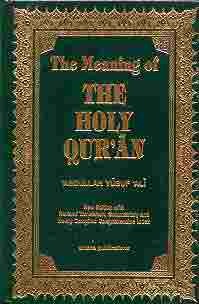 The Revealed Truth of the Qur'an is an exact science and beyond the present comprehension of misguided theologians. The Truth of Qiyamah is a Divine Science beyond the present knowledge of all religious institutions. So you gave nothing in charity to help the spread the Good News of Qiyamah? So you gave no financial support to advance the Message of Al-Qiyamah? So you did not even lift a finger to help His Cause? So you did not even pray that Allah will be successful in His Plan for all humanity? So you did not even look up to the heavens and wish that Allah will be victorious against the evil on Earth? But on the contrary you rejected Allah's Truth! And scoffed His Sure Signs! And laughed at His Announcement! And ridiculed at His Revelations! And smirked at His Plan! And sniggered at His Promulgation! And defied His Great Event! And turned away from His messengers! And returned to your family brimming with personal opinion! And went back to your friends bragging with speculation! And strode over to your relatives with fanciful ideas! And walked haughtily to your comrades with fertile imagination! Woe to you, yea, woe! Again, woe to you, yea, woe! That is disputed by them. Indeed, they will find out. Most assuredly, they will find out.